Hay un pequeño problema, por SCART no se ve parte del laberinto (faltan los bordes izquierdo y superior) lo que dificulta un poco las cosas. Seguramente la placa original le ocurra igual. Las placas hay que ajustarlas cada una para que se vea toda la imagen. @neuro_999: Otra cosa en la que me he fijado es que el core del Berzerk no muestra las scanlines por VGA, es el único core arcade que no lo hace de los que he visto yo. ¿Se podrían activar? Mejoran bastante la imágen por VGA. neuro_999 escribió: Otro mas, esta vez el Time Pilot. just checking, are colours missing with this core? I tried with 2 monitors, changed brightness and contrast. 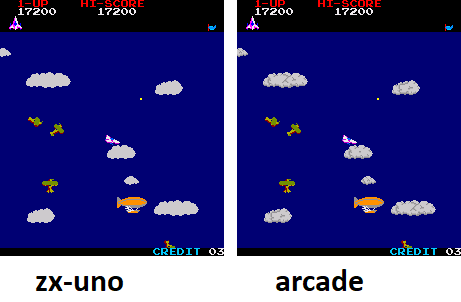 clouds are always 1 grey colour; no shading (arcade has 3 colours). I updated the core but no difference. Screenshot on page shows correct clouds - is this a screenshot of the zx-uno or just one from mame? As far as I know the zx-uno board has 3bits available for each color (rgb). Time pilot required 5bits for each color. So there are colors that cannot be generated by zx-uno. Darfpga escribió: As far as I know the zx-uno board has 3bits available for each color (rgb). Time pilot required 5bits for each color. So there are colors that cannot be generated by zx-uno. By the way antoniovillena says that there is an addons for zx-uno which allow for 6bits for each color. Can somebody confirm that clouds are ok with this add-on? As a new registered to this forum it seems that I cannot reply to PM. Darfpga escribió: As a new registered to this forum it seems that I cannot reply to PM. Now you can reply to PM. I see that the C64 core uses 4 bit colour, is this with an addon?